Just another morning on the central side of Paris! I love that dark blazer with gold buttons! LOVE! Nice Parisien outfit. But I keep looking at the armload of bread…. And I bet this is good bread. I am not saying this just because I’m Frenchie ;-) and that I eat my baguette with Nutella ! Mmmmh yum the baguette! Mmmmh yum that bag! Even without the baguette, she has a typical french style! A real Parisian woman, I love her patent leather shoes and her chic casual style! This outfit is amazing, so stylish!!!! I love Navy and the red lipstick. Her hair reminds me of the cut you featured earlier today. Simple and chic. I have a photo like this in Paris. I don’t look nearly as good. vardagskonst - fashion, inspo, boho. Awesome look!!! I love her shoes and blazer. 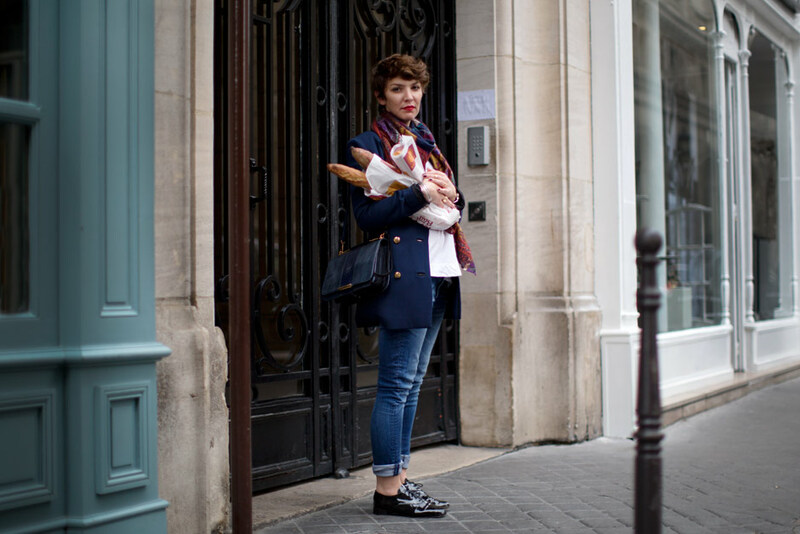 A real Parisian woman, the bread is the perfect accessory! Interesting pic. Very nice bag. Ah those French women…. Who knew a simple pair of patent leather shoes and an armload of baguettes could look so chic? I’m ordering some patent leather shoes like hers today. Just reminded me of my trip to Paris 2 years ago. I could smell the fresh baguettes now. Have to go back! Classic everything that works year after year after year — yet always looks current and right. I love this look, but hard to translate in Canada. tres chic! And I could go for a baguette right about now. You really can’t get much more French then that. Its slightly silly, but mostly very cool. Love this image! Hope I look this good when I’m a little older! One of my favorite styles in jeans, a white t and a navy blazer with gold buttons. this meuf sends some paté !